February 1, 2018 12:35 pm. Certainly one of the most eye-catching horses in training, Godolphin’s emblazoned bay Group 1Breeders Cup Turf champion Talismanic is looking to turn heads again in early spring when he possibly lines up in the Group 1 Dubai World Cup on March 31st. Fresh off a stellar second-place performance in the Hong Kong Vase (G1) behind the brilliant Highland Reel, the son of Dubai World Cup runner-up Medaglia d’Oro, who has yet to race on dirt, is being pointed for the $10 million Meydan Racecourse fixture by decorated conditioner Andre Fabre from his French training base. 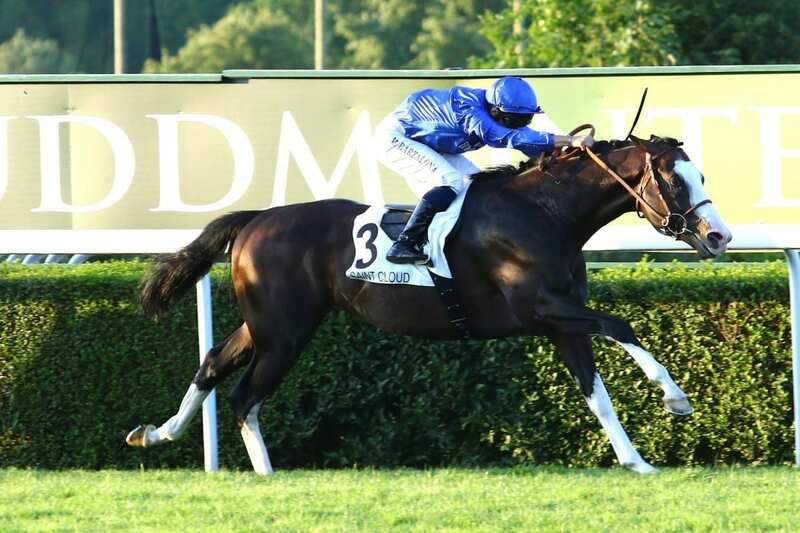 “Talismanic is on course for the Dubai World Cup,” said Lisa-Jane Graffard, who looks after Godolphin’s racing interests in France. “Andre Fabre suggested it after he came back from the Breeders’ Cup as a potential long-range target. The horse has wintered really well and looks in great condition. He appears to have fully recovered from his trips to Del Mar and Hong Kong. Talismanic, who is marked with an appealing excess of white on his face and legs, is out of Group 3 winning mare Magic Mission, a daughter of Machiavellian. A son of Mr. Prospector, Machiavellian sired Dubai World Cup winner Street Cry, among other dirt-inclined offspring. The 5-year-old has six wins and has finished in the top three in 13 of 17 lifetime starts, including a victory in the about-2800m Prix Maurice de Nieul (G2) last July. Long held in high regard, having finished fourth in the Group 1Prix du Jockey Club and then 11th in the Group 1 Prix de l’Arc de Triomphe as a 3-year-old, it was not until the latter half of his 4-year-old season that the world saw the true potential of the hard-trying horse, whose Dubai prep plans are yet to be decided.